When I woke the next morning, there wasn’t the expected tickle of butterflies which usually accompany huge life events. If you went by the way I felt, it could have been any other morning. I went about my routine, had a quick bite of something, cup of tea, I dressed (a rather nicer outfit than was usual I’ll grant you), and I did all those morning things you do. Where were my butterflies? I felt a bit robbed of my right to anxiety as someone about to embark upon the next stage of life. Sam had kindly offered to drop me near Palace Green on her way to take the girls to school. I smiled and waved at them as I closed the door to her Jeep and crossed the road, heading towards Kingsgate and the Cathedral and my destiny (come on, it’s graduation, let me have some melodrama). It wasn’t quite daylight yet and the dark blue, purple sky hung heavy overhead with clouds. I hoped the forecast would be proved wrong but at the moment, it did rather look like it would rain on our parade. I walked over the familiar cobbles and up toward the green. It wasn’t very crowded yet, just a few people in robes and their entourages. I thought back to a year ago when I had seen last year’s crop of graduates and wouldn’t have been surprised had I seen Past Jen staring at me across the green. I headed to the music department to pick up my robes. I hoped that the deliveryman had come after I left as much as to put the poor shopkeeper at ease as to provide me with the correct hood. The queue wasn’t very long and soon I was greeted by said shopkeeper who recognised me immediately. I expressed my relief and smiled as she handed me the rather heavy clothes hanger. She pointed down the hall. I thanked her warmly and headed off in the direction she had pointed. On my way I was stopped by two official looking ladies behind a table. Not for the first time that day I had to check my name against a long list of graduands. I thanked them and finally made it to the robing room. There were about six or seven helpers who were draping excited looking soon-to-be alumni in black. I was called to a woman who had just finished with a fresh-faced undergraduate bedecked in a white fur-trimmed hood. I felt quite jealous that the undergraduates had nicer hoods than us postgrads. She helped me on with the robe and then I ducked down to let her drape the hood over my head. It was pinned in place and I was given instructions for adjusting it as they did have a tendency to slip backwards on the shoulders. 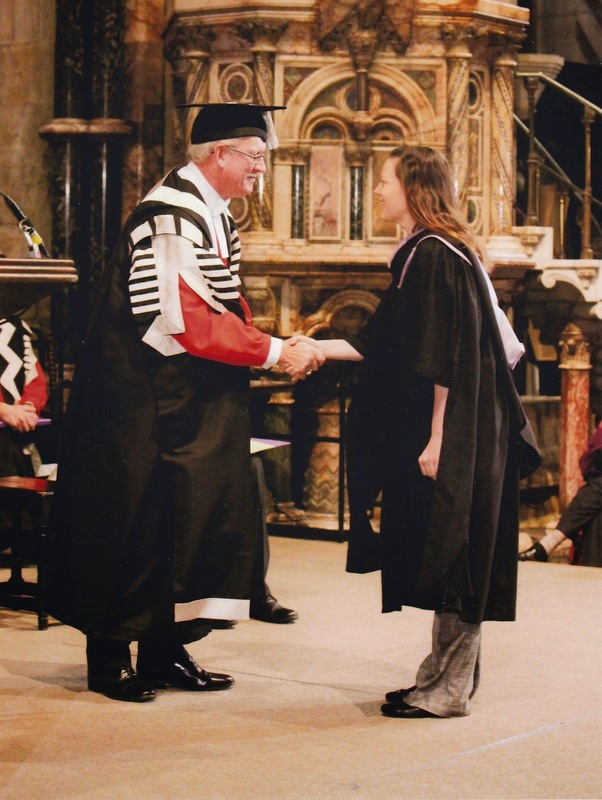 I rather think this had the effect of choking the graduand and wondered if this might not be the final test to pass before being allowed into the Durham University alumni club. I had enough time to have my pictures taken before heading toward the castle to queue up for the march into the Cathedral. I was quite lost in my thoughts when I heard a familiar voice call my name. It was Sophie walking with her mum and fiancé. She was in her robes and smiling. I rushed over and gave her a hug. I couldn’t believe it had been four months. “Are you off to have your photos taken?” she asked. I nodded. “I was thinking the same thing!” I replied. “We’re just going to be sitting over on that bench. Come find us when you’re done,” she said. I said I would and then headed off to have my photo taken. 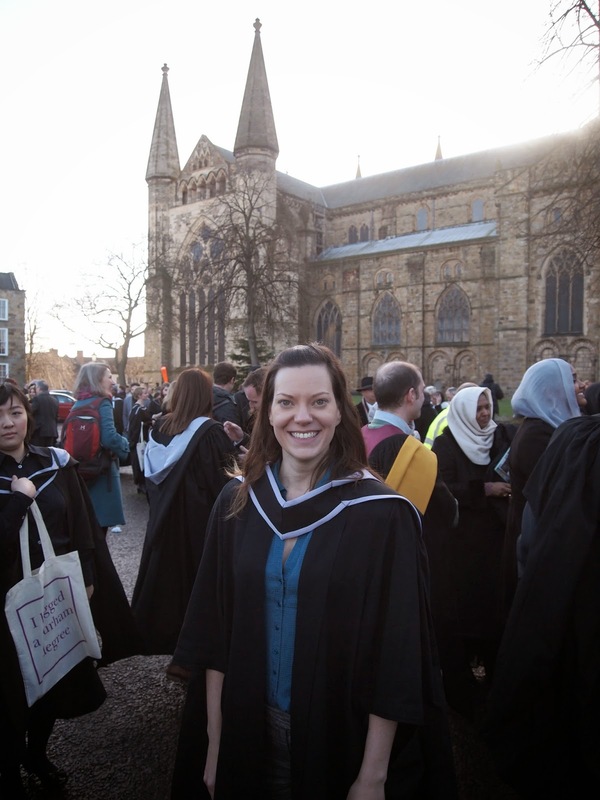 Now, graduands at Durham do not wear mortar boards. Apparently this stems from the first year women were allowed to enter the university. The petulant male students, in protest, through their mortar boards into the river and they haven’t been worn since. (I think it’s high time they were worn again, but that’s neither here nor there.) When having your official photographs taken, you do have the option of wearing the cap. To show solidarity with all female graduates of the university across all of time, I opted to do this. (Also, I just really like wearing them!) In two flashes of the camera, I was done and ushered back out on the green. I met up with Sophie again and soon we were joined by Alex, James, and Jasmine. Jeremy and Kate were stuck in the queue for robes but we knew we would see them soon. We tried to account for everyone on our course. We were anxious to hear everyone’s news and hoping to see as many of our motley crew as possible. Once Jeremy and Kate had successfully retrieved their regalia, we walked en masse toward the castle. me walked over to the castle. It was very sunny at this point. The clouds had been shooed away by our collective happiness. Once inside the Great Hall we managed to find Boya, Jingyu, and Brian. We sighted Joe and Robert as well across the crowded room. I thought back to the dinner Sophie and I had had in that room back in the first month of coming to Durham. It looked quite different now. The tables were gone and the sun was shining through the windows. We all stood catching up as much as we could. We remembered fun stories about Robin being a werewolf and wondering if he would be at the ceremony given the proximity to the full moon. Never have I more keenly felt the effects of the fourth dimension. Time’s tide had once again reunited us, but even as I stood there smiling and chatting, I felt it pushing us ever further from that shore which we had once shared. Never again would that group of people be assembled in this place. Even now we were missing friends, Erin, Amanda, Lauren, Kate G., Sara, Gemma; our circle wasn’t complete without all of them. 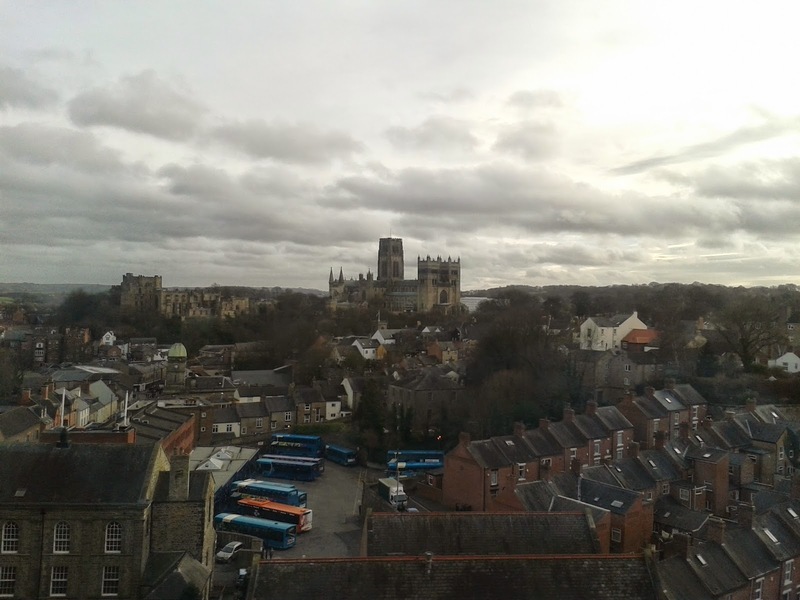 I began thinking about the people I used to see in passing and realising that even if I returned to Durham, it wouldn’t be the same. It could never be the same because the people of the Durham I knew wouldn’t be there. A place isn’t the same if the people you knew and loved aren’t there. Soon a large man with the most amazing booming voice caught our attentions. Alex and I immediately agreed he was the most incredible presence we had yet seen in Durham. He carried himself the way an operatic tenor would; confident in his ability to control a room solely with the power of his voice. He explained the procedure for the morning. We would be checking our names with several lists as we processed into the Cathedral. We would be walking in with a partner who “was the most important person in our lives from this moment.” Alex and I looked at each other hoping that because our names were very close alphabetically we would be partnered up. I breathed a sigh of relief and it was very soon after he began reading the second half of names that mine was called. I was disappointed that Alex and I were not partnered but he ended up being in the pair right behind me and even more fortunately, Sophie was in the pair right behind his. 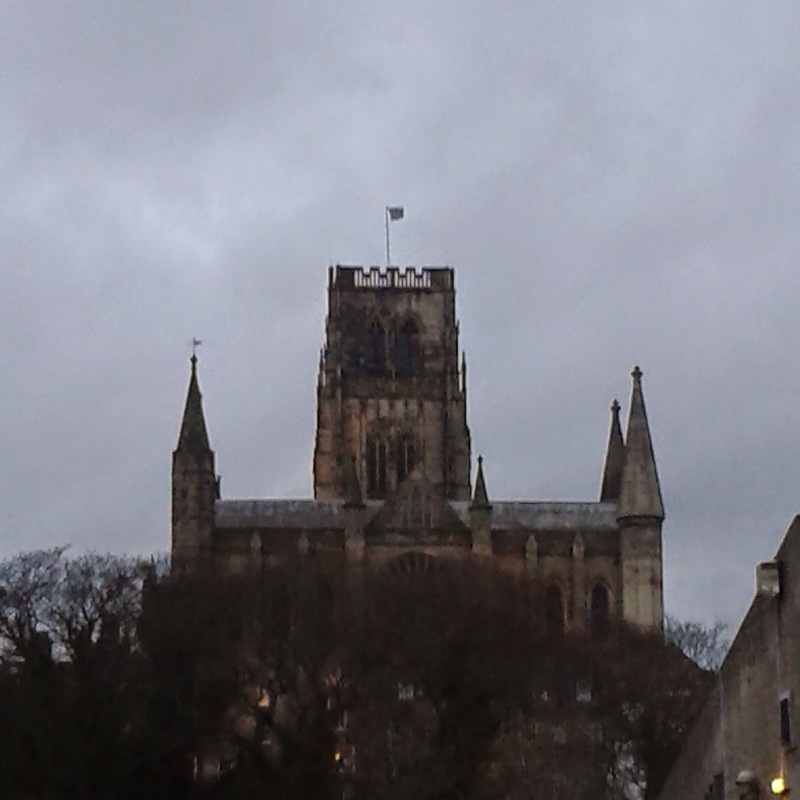 We marched out into the grey Durham morning. It was chilly and I put my hands inside my robe to warm them. We stood waiting for the rest of the group to be put in the processional order. My name was checked against another list as we waited. Finally all were present. Our friend with the booming voice stood on the steps of the castle. He addressed us again and imbued us with the importance of the occasion. We were made to do several cheers and a wave. (This we were made to do a second time as our enthusiasm, perhaps due to the cold or perhaps due to the absurdity of the situation, was less than stellar.) Then we began the walk from the castle, through the gate, across the green, and into the Cathedral. Congregation (as graduation was called at Durham) is a rather odd event. Well, graduation ceremonies in general are odd events. You wear a funny costume, march into a grand building before the important people in your life, listen to elders speak about the future and your obligations to society, then you shake hands with a presiding official as your name and degree are read out for all to hear, and when you march out again, you are somehow transformed. 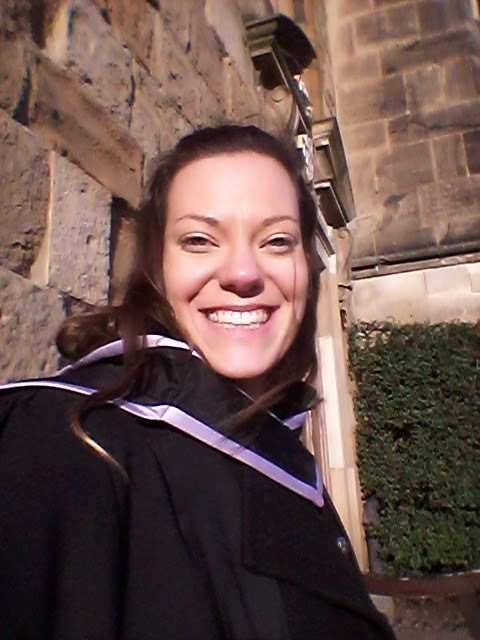 You have gone from student to alumna; from graduand to graduate (an important distinction my English friends clarified for me); from Bachelor to Master. All because you shook someone’s hand and had your name read out. Well, I suppose the year of work had something to do with it as well. Throughout the ceremony, we were entertained by monitors which at times showed images of our procession, the faces of the audience, the faces of all of us, and all of the hand shaking done by the Vice Chancellor. When it finally came time for me, I stood off to the side as a Scottish woman read out my name (mispronouncing my surname). Then I walked up and shook hands. The Vice Chancellor (whose hands must have been smarting by now), took my hand. “Congratulations,” he said with a smile. “Thank you so much,” I returned. This is professional photo taken by Ede and Ravenscroft photographers. Then I stepped off the podium and made my way back to a seat. That was it. Because I was first of us, I did get to see everyone else go up and shake hands. It really was quite remarkable. We really had done it. It really was the end. After the ceremony, we processed out to the green where we hugged, took pictures, and chatted again about all of our plans. Some of us broke up and went off with family. A few of us made plans to go to the department to pick up our final papers and then go off to New Inn. Now a graduate and alumna! Just then we saw Ben coming towards us. I hadn’t realised how tall he was until I was standing next to him and Jeremy who himself stood at 6’4”. I turned to Alex for reassurance about my height. Ben was now head of the Museum and Artefact Studies programme and he polled each of us regarding where we were with our careers. Before I left Durham, he had offered me some pointers about doing a PhD so he was well aware of what direction I was heading in. He talked to us a bit about some of the changes he had made and, in his very enthusiastic way, asked us the best method of forming an alumni network through social media. When he had finished pumping us for input and information and congratulated all of us on our accomplishments, he excused himself and we were left standing in the corner of the corridor. “Do you want to see if Robin is in his office?” I asked everyone. We had come this far and not to see Robin felt rather wrong. We all ventured down the hall toward his office. It was much cooler and quieter in this part of the building. We reached his door and saw him at his desk working. Shyness came over all of us. No one wanted to knock. Finally, I went ahead and knocked a few times. When he opened the door we found the same old Robin standing there. Ginger hair a bit unkempt, and his whole demeanour a bit distracted. If ever there was a living example of J.K. Rowling’s Professor Lupin, Robin is it. He congratulated us all and apologised for not being able to make it to the ceremony. He had apparently been fighting a nasty cold. We all exchanged covert looks knowing full well he was recovering from his latest transformation. As we stood chatting at his door Dr. Caple came bounding down the hall. The last time we had seen him had been over a year ago. He had abandoned us on research leave much to our collective disappointment. He shook each of our hands and congratulated us before heading off to his office. Robin convinced us to head back to the reception where we talked about our plans. Finally, he bade us farewell and headed back to his den, er office. It was sad to watch him go and we felt terribly sad for this year’s crop of Museum and Artefact Studies students as they didn’t have Robin for their lecturer as he was on research leave. By now we were all hungry. Jasmine headed off to have lunch with her family leaving Jeremy, Alex, James, and I to head over to New Inn. We spent a good three hours eating, rehashing the past four months, reminiscing, and being nostalgic as is the right of every person who has just undergone a big life event. It was perfect and surreal. Surreal in that it still felt that we would all walk back to Howlands and to our rooms and see each other at a lecture tomorrow. Jeremy and I walked to the Slug and Lettuce. He had plans to meet up with his former flatmates Sophie and Becca. Both had sung in choir and I was anxious to see them again and I wasn’t ready to call it a night. If I had had my way, that day would have stretched on into eternity so I wouldn’t have to say goodbye to anyone. Unfortunately, I haven’t yet built a working TARDIS and eventually the evening did come to an end and I found myself walking back through the darkened streets of Durham toward Sam’s flat. The next morning I had arranged to have tea with Rune and Jen at Flat White. We had a marvellously long chat and it was then that I felt my new life begin. Both Rune and Jen were PhD researchers (Jen in her writing up stage) and speaking with them really felt like I had turned the page. Like many of the conversations I had had that weekend, we spoke about the last four months and about future plans, but now, for the first time, I felt ready to tackle those future plans. I felt confident. As I headed toward the station, and drank in Market Square for the last time that Durham would ever be the Durham of my recollections, I found that I was ready to return to Leicester and start the new chapter. I wasn’t sad this time either. I was really quite happy. How could I be sad when I looked on the year I spent in Durham? It had been the best year I had known. Gosh there were ups and downs and terrible points, but there were amazing points, triumphs, and I had found myself feeling closer to people than I had ever felt before. The tide had brought us all together for an incredible year and now it was taking us off in different directions. We were all changed though. We had changed each other and we had left our mark, even if only in our hearts, on Durham. As the train pulled out of the station, I looked once more at that Cathedral. I looked and looked until it disappeared behind me. I turned to my backpack and pulled out a book and settled in for another long journey.